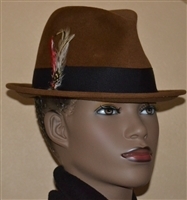 Brown Fedora-velour felt, embellished with black grosgrain and multi-colored feather. Fall/Winter, Camel/Teal Beret. Velour Felt. Embellished with hand created silk leaves. Animal print cloche' velour felt embellished with grosgrain. Fits head size 22 1/2-23".